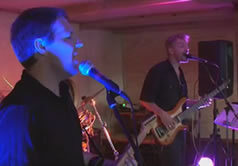 As a duo cover band we have performed at many private functions, corporate events, weddings and year end parties etc. The Venues for these functions or events, have ranged from beautiful Wine Estates to cozy and unique "Bedouin Tents" setup right in the garden of the clients personal home. We recognize that the first part of most events is filled with dinning and speeches and that there would be a need for the function band to accommodate these situations by being able to play backround, soft or easy to listen to music. We as a function band have a pleasant and melodic collection of songs just for this occasion. Later when everyone is ready, we can turn up the volume and get down and party and have some Rock n Roll fun, dancing the night away . So as a function band we are ready to accommodate you as it is needed. Being a two piece function band we can setup (45min) and play in a small space (4 X 2 meters) and do not require a stage if crowd control is not an issue. The space would need to be covered, (if outdoors - to protect from wind and sun) dry and level. We would also require a power point within 20metres of the performance area. We make it a priority to contact the Venue or function coordinator personally and discuss all setup arrangements and requirements. We bring all our own equipment for our performance as well as some basic lighting. We have cordless microphones available for speeches and announcements. We also have a large selection of background and disco music we can play during intervals or after our performance if and when required or requested. We would love to make your wedding or birthday party (30th, 40th - 50th ......) a fantastic and memorable occasion and would be happy to be your function band. We have had a great deal of experience playing in bars, pubs and restaurants. Our large repertoire of popular songs allows us to read the crowd and play festive and entertaining music to get the people going. If you are interested in coming to watch us then please see our gig page for our next public performance or contact us for more details. If you have been to one of our gigs and have some nice pics of the band then please send it to us. 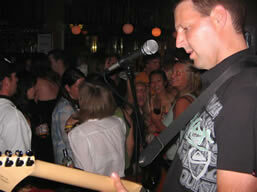 On the right is a picture of us playing at the Dubliner in Cape Town. This is a great Venue for an all night wild party.